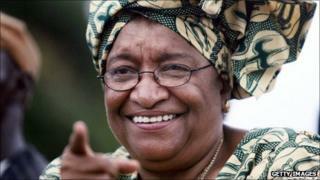 Ellen Johnson Sirleaf, 72, known as the "Iron Lady" by her supporters, has been named as one of three joint winners of the 2011 Nobel Peace Prize. The award comes six years after she became Africa's first elected female head of state following the end of Liberia's 14-year civil war. It also comes just days before she stands for re-election, despite initially promising she would only seek one term. While out campaigning, the diminutive grandmother figure is often dwarfed by her party officials and bodyguards but over a political career spanning almost 30 years she has earned her steely nickname. She was imprisoned in the 1980s for criticising the military regime of Samuel Doe and then backed Charles Taylor's rebellion before falling out with him. After beat her in the 1997 presidential election, she was charged with treason, prompting her to return to exile. In 2009, Liberia's Truth and Reconciliation Commission recommended that she be barred from holding public office for 30 years for her role in backing Mr Taylor, who is currently on trial for war crimes in The Hague. She has ignored the ruling but has apologised for backing Mr Taylor. One veteran of Liberia's political scene said Mrs Sirleaf's nickname comes from her iron will and determination. "It would have been much easier for her to quit politics and sit at home like others have done but she has never given up," he said. She won the 2005 election run-off even though she faced probably the best known Liberian - former football star George Weah. Despite the popular appeal of her opponent, analysts say she won because of background as a development economist. Mrs Sirleaf has held a string of international financial positions, from minister of finance in 1979 to Africa director at the United Nations Development Programme. So many people felt she was well placed to rebuild Liberia's shattered economy. Since becoming president, she has cancelled and renegotiated a $1bn contract with the world's largest steel company, Arcelor Mittal, which has since started iron ore production in the north east. Another $2.6bn iron ore concession agreement was entered into between the government and China Union, a consortium of Chinese companies. But she says that her work has not finished, which is why she changed her mind and decided to seek re-election. "When the plane hasn't landed yet, don't change the pilots," her posters say. Some poor Liberians complain that their lives have not changed much since Mrs Sirleaf became president. Many educated Liberians - and members of the old elite descended from freed American slaves - gave Mrs Sirleaf their backing in 2005. While men continue to dominate life in rural areas of Liberia, in the cities, some women and some gender-sensitive men felt it was time the country had a female leader - after a succession of men had brought the country to ruins. Mrs Sirleaf said she wanted to become president in order "to bring motherly sensitivity and emotion to the presidency" as a way of healing the wounds of war. Throughout her campaign, she has said that if she won, it would encourage women across Africa to seek high political office. She constantly stresses her commitment to the fight against corruption and after returning from exile, she served as head of the Governance Reform Commission set up as part of the deal to end Liberia's civil war in 2003. She resigned that post to contest the presidency, criticising the transitional government's inability to fight corruption. However, her opponents now make the same claims about her administration and even accused her allies of buying votes ahead of Tuesday's re-election - charges they strongly deny. On her father's side she is descended from a traditional chief, while her mother's father was a German trader. She was married aged 17 to James Sirleaf but they later divorced. She is the mother of four sons and has six grandchildren.